Over six months ago our kitchen flooded. After our initial panic, we remembered that we had insurance - and we contacted them immediately. Well to say it's been a lengthy process is an understatement. The basement room which was damaged was repaired in under two months time. 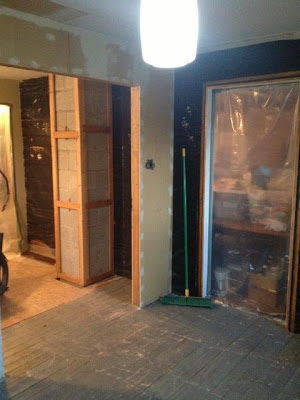 However, it has taken over six months for the kitchen work to begin. I jokingly asked the contractor if the kitchen would be done by the time my child was born - he sheepishly said "I hope so". I hope so? Oh dear. So right now the entire contents of my kitchen are packed up and stacked throughout the house. Our home is only 1200 square feet, and it's amazing how much stuff can be jammed into a kitchen. If you were to enter our home right now, you may believe that you have stumbled across some serious hoarders. Every inch of space is covered in bins and boxes. I have committed to myself that not all of this "stuff" will be returning to the kitchen. Do I really need that many wine glasses? Or three entire sets of tupperware? It will be an opportune time to downsize and declutter. 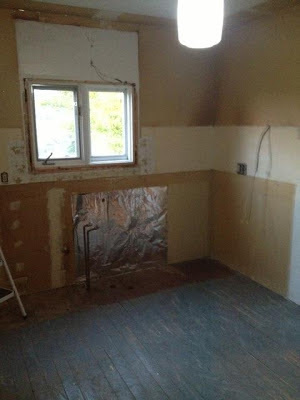 In the meantime, our kitchen has been stripped to the bare bones. The original wood flooring, and the tar paper walls. To some it looks shocking, to me - it looks like progress.